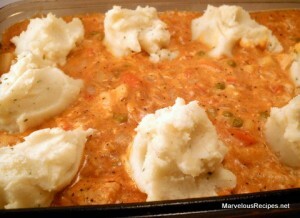 Tender chicken, wholesome vegetables, creamy mashed potatoes and savory sauce; yummy! 1. Spray a 2 quart shallow casserole with cooking spray. Make mashed potatoes according to directions on box for 4 servings-except use 1 cup hot water, 1/2 cup milk and 2 tablespoons butter or margarine. 2. Melt the remaining 1 tablespoon butter or margarine in a 12-inch nonstick skillet over medium-high heat. Cook chicken and onion in butter, stirring frequently, until chicken is no longer pink in center, about 5 minutes. 3. Stir in vegetables, gravy, 2 teaspoons of the paprika, salt and pepper. Cover and cook over medium-low heat for 5 minutes, stirring frequently. Stir in sour cream. 4. Spoon mixture into casserole. Spoon or pipe potatoes in 8 mounds around edge of casserole. Sprinkle potatoes with the remaining 1/4 teaspoon paprika. 5. Bake at 350 degrees F for 25 to 35 minutes or until bubbly around the edges. Makes 4 servings.